It's at Daiso where my little insignificant, pointless, niggling and piddling dreams come true. Thus these tartlets were born. We all know that there are mama melon ballers but dare we dream that there baby melon ballers? I did. And my melon baller dream came true. Now....dare you tell me that that baby isn't cute! Because fresh fruit tartlets are prettiest when topped with small dainty fruits like berries (in my book), but which are ridiculously priced if you're living right smack on the equator, I have never bothered to make fresh fruit tartlets. Until I found this baby melon baller. Now I can make my own tropical 'berries' for tartlets anytime. From baby mango balls , baby bright red water melons balls to baby jade honey dew melon balls. 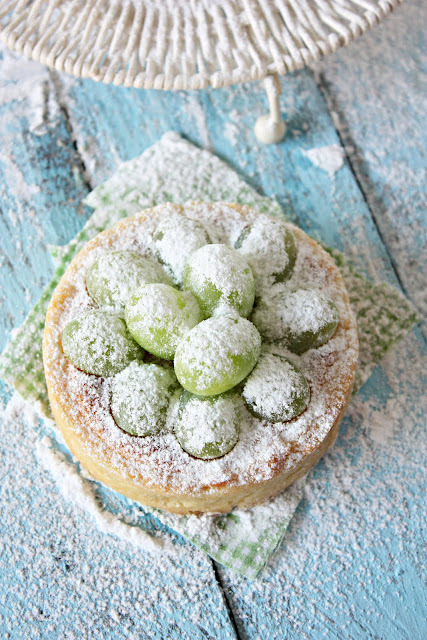 Angie from Angie's recipe had this Fresh Fruit Tartlets recipe that had a filling of a ground hazelnuts-butter-sugar paste instead of custard. I thought the moist, rich, nutty paste was a brilliant change from the usual custard filling...a filling that I was never inspired to make for fresh fruit tartlets. So I am glad I made these because both the subtley sweet, crusty pastry and the moist hazelnut filling is to die for. And the squishy, spurty and juicy mango and baby grapes on the top made a perfect finish. Truly...quite a remarkable recipe. Thanks to Angie. I would make these if I were you. Put everything in one bowl and work in the butter until the mixture resembles corse breadcrumbs. Then bring everything together with your fingers until it becomes a soft dough. Refrigerate for about 30 minutes before rolling out to line the baking tart tins. Angie used 4, 12 cm tart moulds. I used 4 egg rings and 2, 12 cm tart moulds. I rolled the pastry between two sheets of baking paper for easier lifting of the pastry. The pastry is quite soft and rich. Roll out to 1/4 inch thick and line the tart moulds right up to the sides. Prick the base with a fork. Refrigerate while you make the filling. Beat butter and sugar with a wooden spoon until thick and creamy and soft. Add egg and beat again until well combined. Add in the ground hazelnuts and fold in. Fill the pastry lined moulds until 3/4 full. Do not fill right up because the filling will puff up a little upon baking. 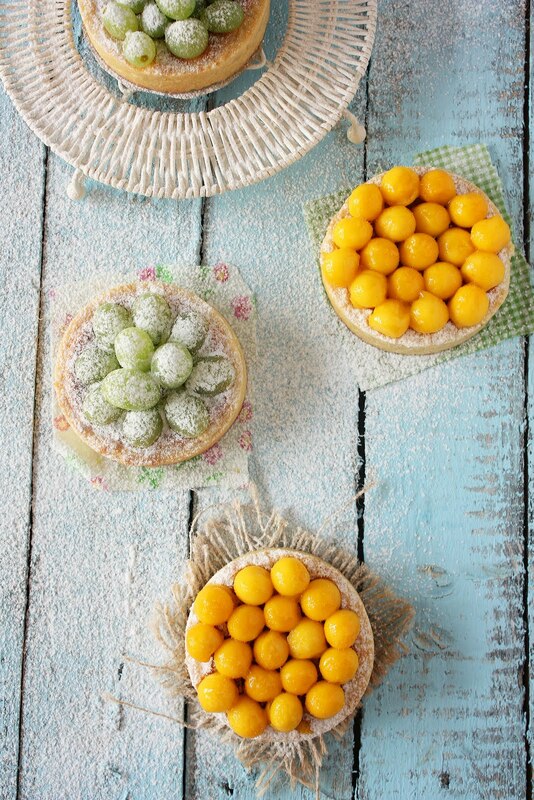 The little space between the top of the baked filling and the rim of the cooked pastry allows the fruits berries or balls of fruit to stay within especially if like me you do not use a whipped cream topping for the fruit to rest on. Que pinta tan deliciosa, me encanta como te ha quedado. How adorable! They look so very delicious too. So cute! I need a baby melon baller! 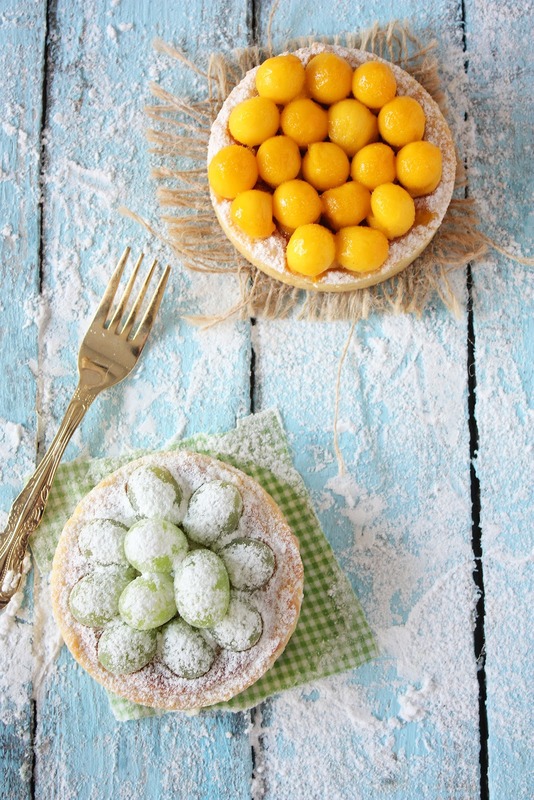 Lovely tarts and lovely photos, Zurin! 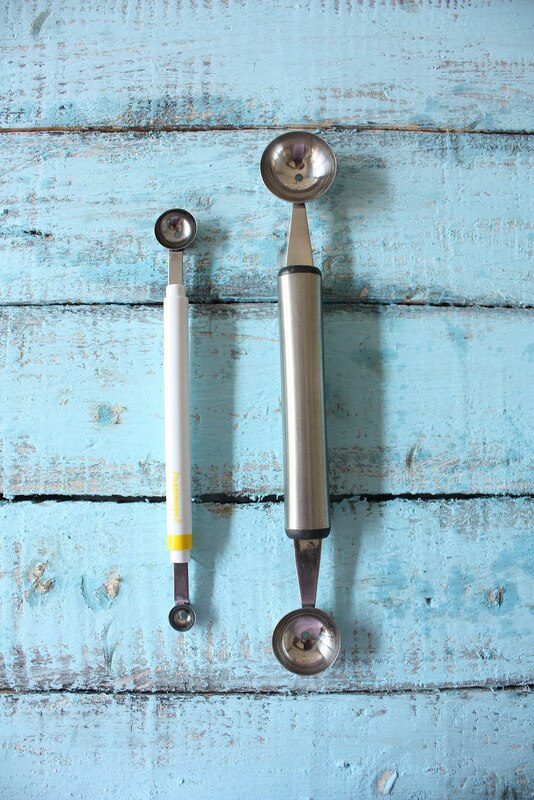 And of course, you've got me lusting after those baby melon baller! Off to Daiso it is! Am guessing that you've painted the baby blue aged plank yourself? :) Goes really nicely with the tarts! yes I painted it myself. I got some used planks from a house that was undergoing some renovation that I happened to drive pass one day. Nailed them together and painted it. :) The things we do to blog ! simply awesome! and so cute! I could never get my 'balls' to look like spheres. They are always flat on one side. what a great dramatic change in texture; Love it!!! 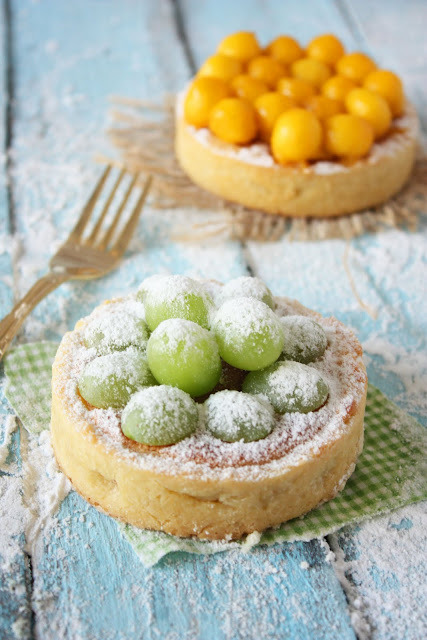 Very clever topping for those pretty tarts. Melon is so cooling in summer, too, that makes for a refreshing bite. those tartelets look adorable and best for refresh on a hot summer day. Hello dear Zurin. When I have a break from blogland; I seriously have a break! Have thought of you from time to time and have felt rather guilty actually for not visiting before this. Mind you, I haven't dropped in on anyone else either. Good to see you are still enjoying life. And things like baby melon ballers are giving you such pleasure. I fully understand and can well relate! 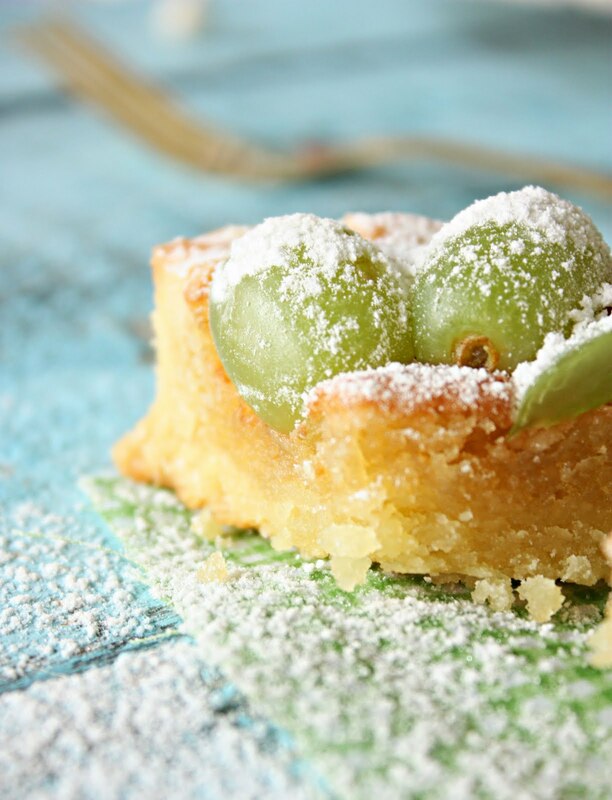 Your tarts do look divine and the filling is similar to the old frangipane filling. I made one years ago with almond meal instead of hazelnut, topped with fresh strawberries and bluberries and entered the recipe in a national butter competition. I made the finals and I had to go to the Sydney entertainment centre along with fifteen other contestants from all around Australia to cook my dish in front of a panel of judges. I won electrical goods to the value of four hundred dollars but I would have much preferred the top prize of a trip to France. I haven't made the tart since that day because I think I made one every day for the week leading up to the contest! Ahh the memories. I missed you. But we all deserve a break and good for you for taking a good long one! Blogging can get quite trying sometimes and we need a COMPLETE break every so often. So don't feel bad at all Mariana. Coming to your blog is liking coming home again! I've been out of pocket lately. Lovely tarts and I love the blue table. those are SO beautiful. When I saw the top photo a few moments ago, I could not work out what fruit it could be until I read your post. It looked bright like mango.... but I couldnt work out how you could ball a mango ! How neat is your mini baller ! OH -I got not one but TWO parcels left for me by the postman today. How exciting! Oliver is going to love those funny egg boxes. I've told him what they are and will let him have a go tomorrow. As for me, I've got so many things to play with it's hard which to choose first. I've been an idiot and managed to delete my entire email box this morning so lost absolutely all my emails and contacts in one foul swoop and can't restore it. Wasn't as stupid as it sounds... Screen froze as I was deleting a file. Wiggled the mouse some more and it removed the whole blooming account. I could scream ! Awww thanks for the buzz :)...the melon baller is cute. And little. I 'll get you one. Glad you received the parcels :)) will email you..
Now all I want is a baby melon baller! Haha. Love these cute tartlets, it's such a good idea to have the teeny balls of fruit as a decoration!